Every time we think the Browns can’t sink any lower, they drain a little more water out of the pool. Case in point: Sunday’s 30-12 loss to the Houston Texans. The Browns went in to the game as 11 point underdogs and certainly played that way. The Browns totaled 10 first downs and 172 yards of offense. Houston’s Arian Foster rushed for 124 yards, Ben Tate ran for 115 and both scored touchdowns. Cleveland’s Chris Ogbonnaya finished with 28 yards rushing, Thomas Clayton had 10; the Browns finished with just 44 yards on the ground. 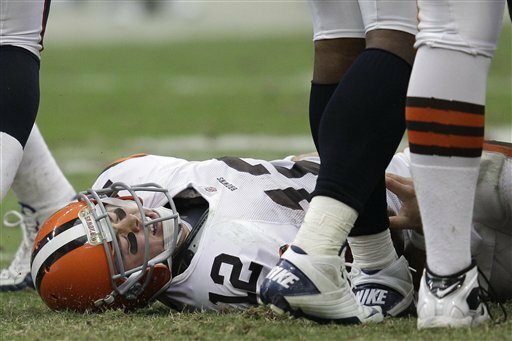 The Browns have now gone eight consecutive games without scoring a touchdown in the first or third quarter. The Texans got the ball to open the game and went 82 yards in nine plays for a touchdown. Ogbonnaya fumbled on the Browns first offensive play, the Texans scored six plays later and the game was essentially over. The Browns are broken – especially on offense – right now and there seems little anyone can do to fix the problem. The team can’t do anything on offense – it can run, it can throw long, it can’t throw short, it can’t protect the quarterback (it will be a miracle in McCoy makes it 16 games in one piece). Josh Cribbs continue to be the lone bright spot on offense – and the one player that really seems to bring it every week. Cribbs, playing in his 100th career game, had a 64-yard kickoff return, five receptions and a touchdown. He’s already set career bests with 22 catches for 298 yards. He also had three tackles on special teams. We knew coming into the season that things could get rough. With only two drafts under his belt and a reduced off-season, there has only been so much that general manager Tom Heckert could do to clean up the mess left for him by Phil Savage and Eric Mangini. There are only four players left on the team from Savage’s last draft in 2008 and Mangini’s one-and-only draft in 2009. Maybe if they didn’t have so many holes to fill across the team Heckert would have realized what a bad idea it was to go into the season relying on Tony Pashos at right tackle, who’s been a turnstile and is now injured again. Unfortunately there is nothing the Browns can do about those problems now. They have to face the last half of the season with the team they have, not they one we wish for. And the team is left to come home, lick its wounds, and get ready for the 1-7 Rams next weekend at home. The Rams have somehow managed to score fewer points than the Browns this season, so we should all be in for some kind of offensive treat next weekend. For now, we’ll leave it to Cribbs to sum up the loss to the Texans.